Ducts are used to supply conditioned air to different parts of a building. Duct systems are generally made from sheet metal, duct board, or flexible duct tubing. 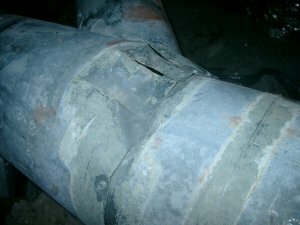 There are many connections, joints, and seams in a duct system, all of which are possible sources of leaks. These leaks not only waste energy, which result in increased utility bills, but they also degrade air quality, which introduces contaminants and irritants into the system. 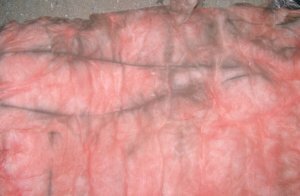 Insulation does not stop air leakage, but rather acts more like an air filter. The picture on the right is an example of how insulation shows traces of air duct leakage. Dirty lines on the inside of this duct wrap insulation show where the leaks were. According to the Rocky Mountain Institute's Home Energy Brief #3, sealing duct work can help save up to $300 a year on cooling and heating costs. A diagnostic tool which pressurizes a duct system is used for duct leak testing. Perhaps the most widely used piece of duct leakage test equipment is the "Minneapolis Duct Blaster" made by The Energy Conservatory. Using this air duct testing equipment, a fan blows air into the ducts and pressure differentials are used to determine the rate of air leakage. It is common to see leakage rates of 250-400 CFM in older duct systems. This amount of leakage can result in a 30% or more reduction in operating efficiency, wasting hundreds of dollars every year. Every connection and seam is a possible source of leakage, and must be properly sealed. Factory made boots and elbows have seams which leak air. Even the longitudinal seams on metal ducts should be sealed. Despite its name, duct tape is NOT suitable for sealing ductwork. 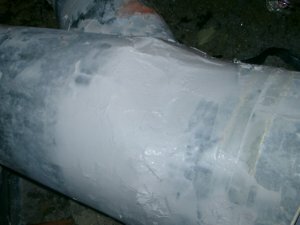 Duct Mastic is the best sealant to use. Before Sealing (leaking ~8 CFM) After sealing with mastic and reinforcing mesh. Starting in 2009, the International Energy Conservation Code (IECC) requires a duct test to be performed in both new construction and major renovations. This test must be performed by a qualified third party inspector. If you live in the Dallas/Fort Worth area, please call us at (972) 499-4550 to schedule a diagnostic test on your ducts. We work with several experienced contractors in the DFW area to provide testing services. The cost for this diagnostic service depends on your system, but call us for a free estimate.